The weather outside might be getting colder, but that doesn’t mean the fishing has to stop. There are lots of options for winter fishing, also known as ice fishing in some parts of the USA, and the best winter fishing tips to get the right gear is imperative to stay warm and safe. So sit back, relax, have a warm cup of cocoa, and let’s dive right into the best winter fishing tips to ensure the family fishing trip is amazing this season. Anytime an angler is trying to stay warm, there are a few basic items that need to be considered. After all, every minute spent trying to get warm is a minute not spent catching fish. The key here will be dry layers. Base Layer – Layering is crucial to staying warm. It provides the ability to control how much warmth is maintained while also allowing a wet or torn layer to be removed without exposing everything to the elements. Make sure the base layer will take sweat away from the body. Modern wicking fabrics are good, but so is good old fashioned cotton. Just remember, sweat against the skin can freeze, so keep that body dry. Socks – Insulated socks are an outdoorsman’s best friend. Keeping the extremities warm ensures the body doesn’t have to work as hard to maintain core temperature. That means more energy for fishing instead of shivering. Middle Layer – A sturdy sweatshirt will work wonders here. The hood allows extra head cover if needed, and the level of warmth can be controlled with the pull of a zipper. The middle layer is all about controlling warmth. Shell Jacket – The shell layer, or shell jacket, keeps the angler dry and helps blocks the wind. These jackets can be thin, lightly insulated, layers that are more about stopping the wind chill and wetness than anything else. Boots – Don’t skimp on boots. 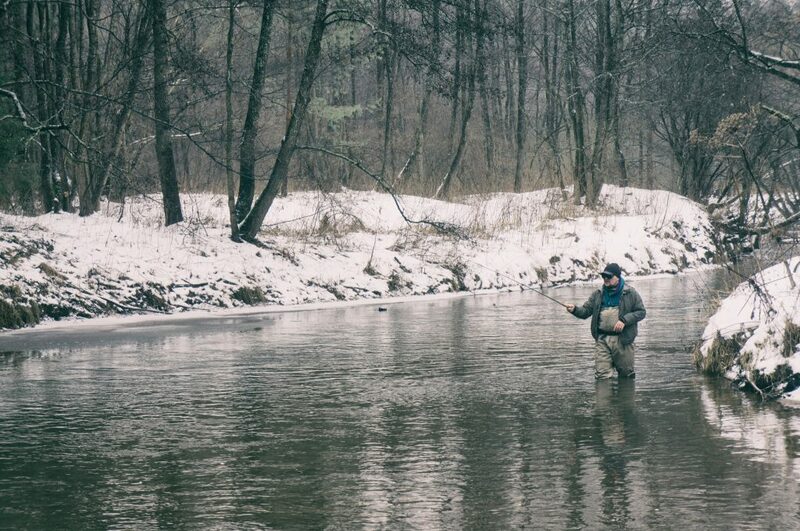 Nothing will ruin some of the best winter fishing quicker than wet, freezing feet. Boots should be waterproof, non-slip, and able to lace up quickly. Personally, our go-to pair recommendation is a good set of Marine Corps deck boots. If the boot will survive a storm at sea, chances are it can handle some winter fishing. Gloves – The perfect pair of fishing gloves has yet to be invented. Gloves that are thick enough to keep an angler warm while motoring to a spot are too thick for angling. Those that are thin enough to be fishing gloves just aren’t that warm. The solution is to have several pairs. Make sure they can resist water and have a layer of insulation, then swap them out as needed. For the best winter fishing, make sure to have at least four pairs. Head Covering – Hats. The human body is like a chimney. That means all the heat goes up and out the head. To stay warm, keep that dome covered. The best hats will be warm and have the ability to fold down over the ears and even across the face. Few things will make an angler cold faster than an exposed face and head. A baseball cap just won’t do it. Once the best winter fishing gear has been assembled, make sure to have a complete second set, along with a blanket that is sealed in waterproof bags and packed in a backpack. The key to staying warm while winter fishing is to stay dry and covered. Too many winter anglers have been seriously injured or had frostbite because their gear got wet and they had no backup. Make sure there’s enough gear in a separate bag that someone could fall in the water, be completely soaked through, and then be able to replace all their layers with dry clothing. 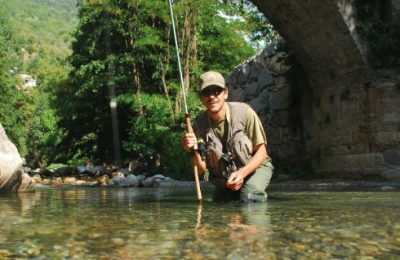 For the serious angler, there are destinations that should not be missed during the winter. 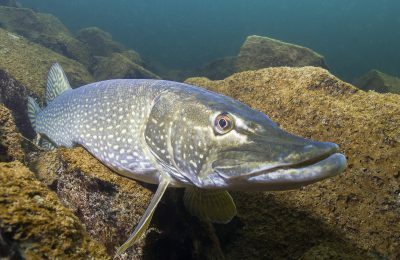 These can be both warm and cold climates, depending on the fishing experience desired. 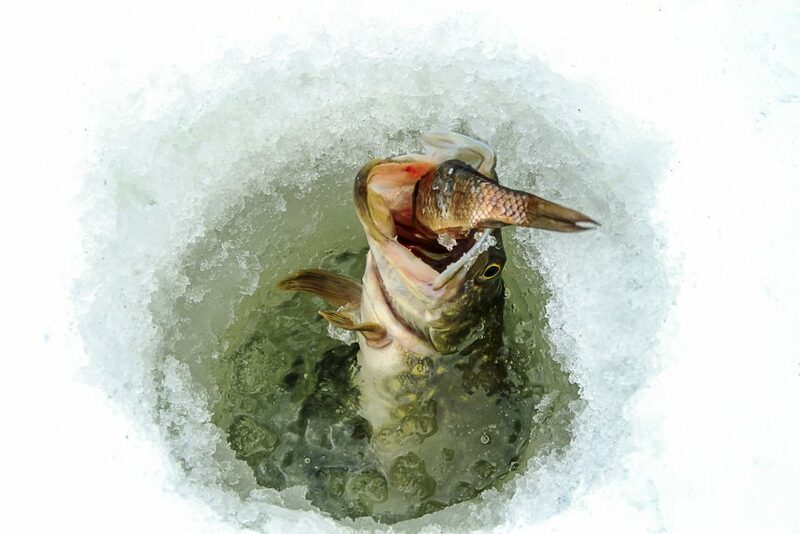 Whether you are ice fishing or just fishing in the winter, these life-saving tips are critical. 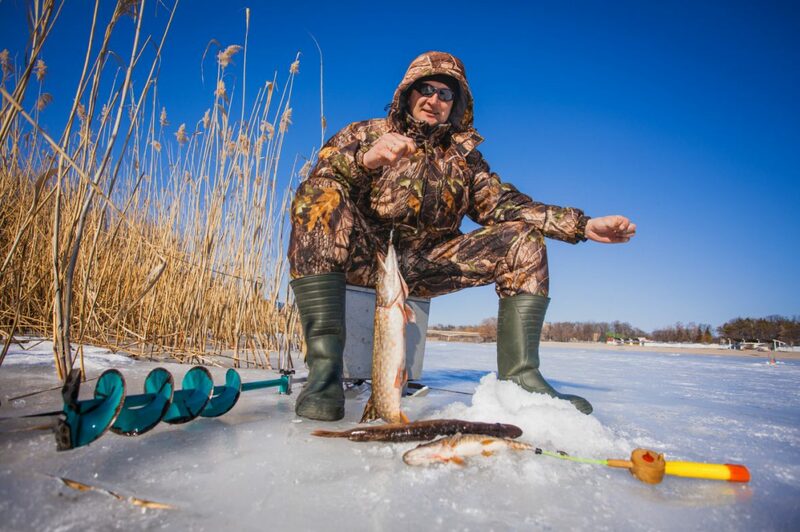 For those looking to get some serious winter fishing in, there’s no place like Wisconsin to find thick layers of ice and deep waters filled with fish. Ice fishing is a tradition in and of itself, and there are plenty of guides and trips to help the novice ice fisher experience this unique form of angling. Lake Winnebago is one of the ice fishing meccas and should not to be missed. For the best excursion get away, look no further than Lake of The Woods, Minnesota. A variety of lodges and full-service guides and tours are available for every level of experience. For those looking to escape the deep freeze, Florida fishing tours hit their peak season during the winter months when thousands of “snow birds” flock to the warmer climate in search of fish. The Florida Keys are teaming with all types of game fish that also moved to the warmer waters, making these iconic keys a great place to spend a winter week fishing. Here at Rusty Angler, we believe in fishing giveaways for our valued readers. 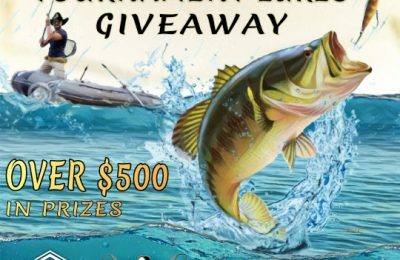 While a fishing giveaway might land some free swag, these fishing sweeps are a great way to enter competitions for extra angler gear. 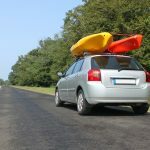 In the winter while ice fishing or just fishing when it’s freezing outside, not only are there great fishing promotions for winter gear and tackle, there are also tremendous savings to be had on warm weather gear. 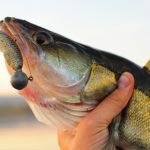 Companies will be coming out with new gear in the spring, and they will have fishing promotions specifically to attract new buyers or to highlight new products. We hope the best winter fishing tips for the right clothing helps keep the family warm this season. Look for a special fishing promo code when browsing or ordering new equipment. These codes can earn a shopper anywhere from 10 percent to 50 percent off their purchase. So while the weather outside might be frightful, the fishing giveaways are delightful.